A 2017 season that began with so much promise spiraled out of control for Bill O’Brien and his Texans, culminating in a 4-12 record. A promising rookie quarterback paired with skilled offensive playmakers and a ferocious pass rush led many to pick the Texans to come out of the weak AFC South. J.J. Watt’s season-ending injury in Week 5 took the air out of Houston’s sails and all but doomed the season for this young crew. If Watt’s injury was a knockout blow, losing DeShaun Watson later in the season was like being picked up off the mat and subsequently body slammed. The usual suspects return in 2018 and expectations are extremely high. The Houston Texans betting odds indicate they may be one of the more competitive teams in the whole NFL this season. Defensive linemen J.J. Watt and Jadeveon Clowney comprise the most powerful, explosive, and disruptive pass rushing duo in all of football. Steadily improving in each of his first four seasons, Clowney looks to finally break out as a bona fide superstar and fulfill the astronomical potential his enormous frame grants him. Watt simply hopes to return to elite form without any lingering effects from his 2017 season-ending knee injury. In his first season as the #12 pick out of Clemson, DeShaun Watson showed flashes of greatness before an injury forced him to the sidelines. With nearly 1,700 yards, 19 touchdowns, and a passer rating of 103.0, Watson was a front runner for rookie of the year. He responded to the added pressure of losing J.J. Watt by channeling his leadership qualities and improving his performance on the field before being reduced to a cheerleader. A full season of a healthy Watson under center should allow the Texans to easily double their win total from last season. Watson’s main target is the man they call Nuk, Texans star receiver DeAndre Hopkins. Entering into his sixth season, it is hard to believe the wideout is only 26-years-old. Hauling in over 1,300 yards of passes in 2017, Hopkins has been a mainstay among the receiving yards leaders since his arrival into the league. Lamar Miller rushed for 888 yards in 2017 and returns once again as the Texans’ featured back. While not breaking off monster runs and changing games in one play, Miller is a reliable, consistent option capable of drawing the attention of opposing defenses away from the Watson-Hopkins connection. You cannot stack the box, double team Hopkins, and contain Watson’s legs. The Texans are just balanced enough on offense to create and exploit favorable matchups. Here at SkyBook, we pride ourselves on being the best NFL sportsbook for all your football betting needs. 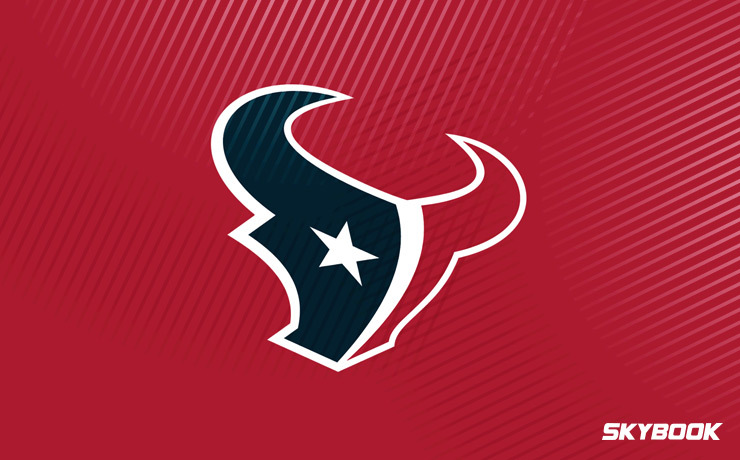 If you want to follow or bet on the Texans this season, we will deliver you game analysis, matchups, and injury reports all right here in one convenient location. The Houston Texans betting odds to win Super Bowl 53 are 18-1. Those bold enough to back this explosive, young roster will be rewarded handsomely. Remember, we have the best football betting environment along with great bonuses that you will not find at any other sportsbook.